Here, seven terrific recipes to make with sustainable fish (according to Monterey Bay Aquarium's seafoodwatch.org) such as wild Alaskan salmon and Pacific halibut. 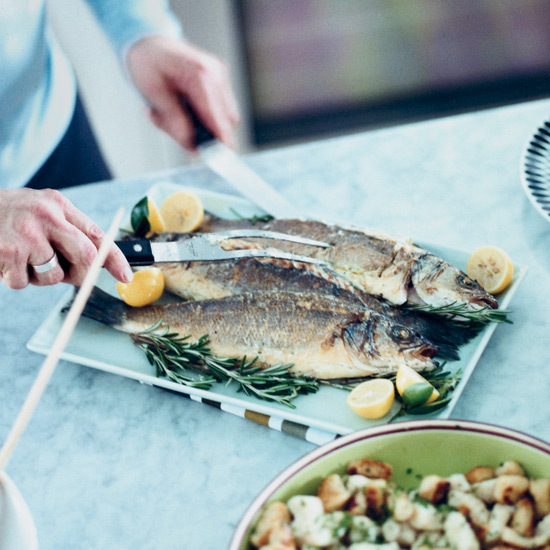 Whole fish are usually less expensive than fillets, and the presentation is more impressive. Plus, leftover fish is fantastic in these grilled salmon sandwiches. What's the secret to this easy Tuscan dish? The sea bass fillets are rolled up before roasting to keep them extra-moist. F&W chef-in-residence Eric Ripert's quick, healthy recipe features a savory sauce made with lime juice, ginger and the Japanese spice blend togarashi. Jose Enrique's flaky fish fillets are topped with a spicy garlic-and-citrus sauce. Four kinds of chile—whole and in hot sauces—star in the spicy, sweet sauce for these healthy salmon fillets. “It’s almost impossible to end up with dry, overcooked fish when cooking it whole,” says chef Steve Corry. Creamy raita balances the richly spiced fish in this terrific Indian-inspired recipe.